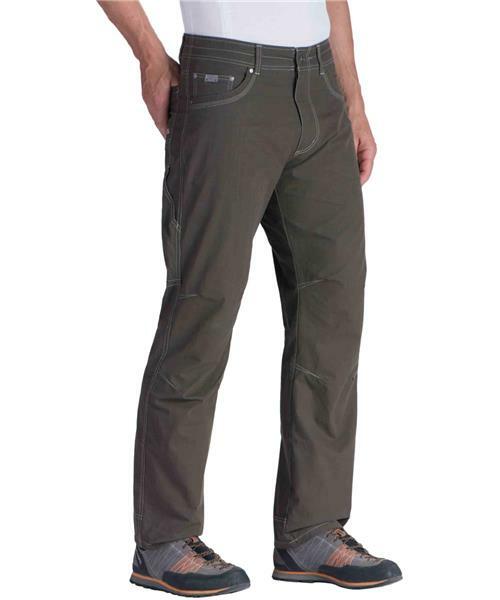 The KÜHL REVOLVR™ Pant is our lightweight, Überkühl™ travel jean. By blending 26% nylon into the ultralight 5.1 oz. /sq. yd. combed cotton canvas, Überkühl™ fabric provides the lightweight comfort and breathability of cotton with the added durability of nylon. The FULL FIT features a full seat and thigh for a more relaxed fit, while the Vintage Patina Dye and river wash create a vintage look. KÜHL's Free Ryde™ waist, articulated knee, and gusseted crotch allow true freedom of movement. Featuring scuff guards at the cuffs and pockets, the easy care KÜHL REVOLVR™ is the perfect travel jean.